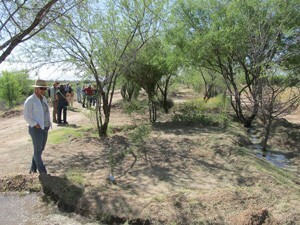 On April 10, 2015, the Arizona Riparian Council toured the Hik:dan Project, where the San Xavier District, Tohono O’odham Nation is using Central Arizona Project water to restore riparian ecosystem components to the Santa Cruz River. The project has been going now for 10 years or so. Sally Pablo, Director of the Natural Resources Program told us about the project, and then we toured the site. David Tenario, Natural Resources Department Assistant Supervisor also assisted with this tour. 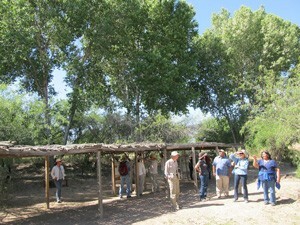 ARC members tour one of two Santa Cruz River restoration sites at San Xavier District. The San Xavier District’s project was funded by Arizona Water Protection Fund. their riparian restoration project. This mature project features cottonwoods, Goodding willow, sycamore, mesquite and other native species. It includes a CAP recharge component that is helping support a shallow water table.